Filed to: More Like Doctor Whoops Am I Right?Filed to: More Like Doctor Whoops Am I Right? More Like Doctor Whoops Am I Right? 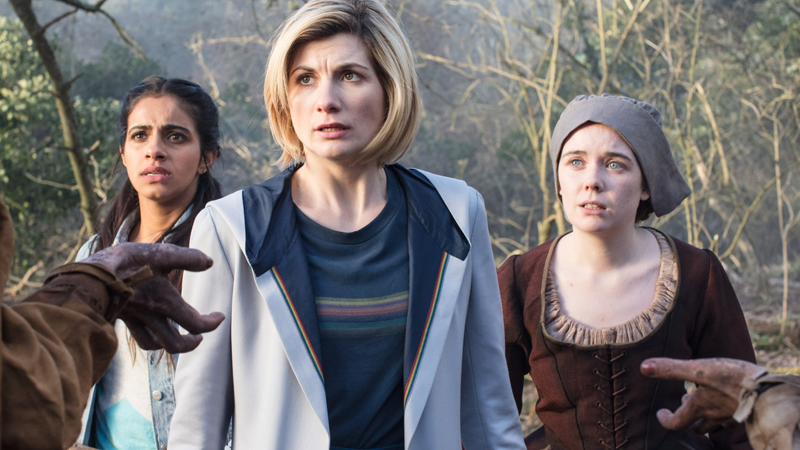 The 13th Doctor and her friends find themselves facing a sinister new threat... Amazon streaming executives? Last week, Doctor Who’s 11th season aired an episode called “Kerblam!” about a futuristic online retailer that was, basically, space-Amazon. Jeff Bezos’ ubiquitous company didn’t get a name drop but honestly, it didn’t need it—it was an incredibly unsubtle jab. So it’s darkly funny that, if you were in the U.S. last night and wanted to watch “Kerblam!” on Amazon Video (the only way to stream Who’s latest season outside of BBC America’s app)...you instead got another episode entirely. In fact, you got “The Witchfinders”, which is set to air in the UK and the US this coming Sunday. Who said it, Judy or King James I? 17th century England, known for its conveyor belts. I know it’s Doctor Who and the show loves its mishmash of history and future-tech every once in a while, but that’s not the case here.